We'd spent the night camped off Cottonwood Valley Rd on BLM lands south of SR160 near Red Rocks, NV. We'd been treated to a total lunar eclipse that evening which meant a combo moonset/ sunrise the next morning. I'd already been to Bridge Mtn twice, but as perhaps the most popular Red Rocks scramble, I wanted to let Eric and Steve experience it on their first visit to the area. Karl had tried this route solo on a previous occasion but turned back, so I thought it would be great fun to get him to the summit as well. I didn't really hold out hope that Eric would be able to make the summit since we had his dog Leroy with us. Leroy was capable of easy class 3 scrambling, but steep class 3 would be another thing. I figured we'd all get to the start of the class 3+ crux, after which Eric and Leroy would have to wait behind for our return. At least that's how it all went down in my head before the day had started. What I had not counted on was the turn of the weather. It was expected to be sunny and windy which seemed unlikely to strongly dampen our efforts. Instead, Mt. Charleston conspired with the wind to create some clouds of its own which spilled into the Red Rocks area and pelted us with blowing snow. It was perhaps the coldest day I'd had yet in Red Rocks, one that had me bundled with a fleece and jacket all day long. We had the advantage of the jeep on this go around, allowing us to drive to the top of Red Rock Summit via the rough 4WD road that can be accessed from Scenic Loop Rd. The drive is a long one and it wasn't until after 8:30a that we had reached the pass, parked, and started off. Despite it being the MLK holiday, ours was the only vehicle at the pass all day and we saw no other parties on this otherwise very popular mountain. 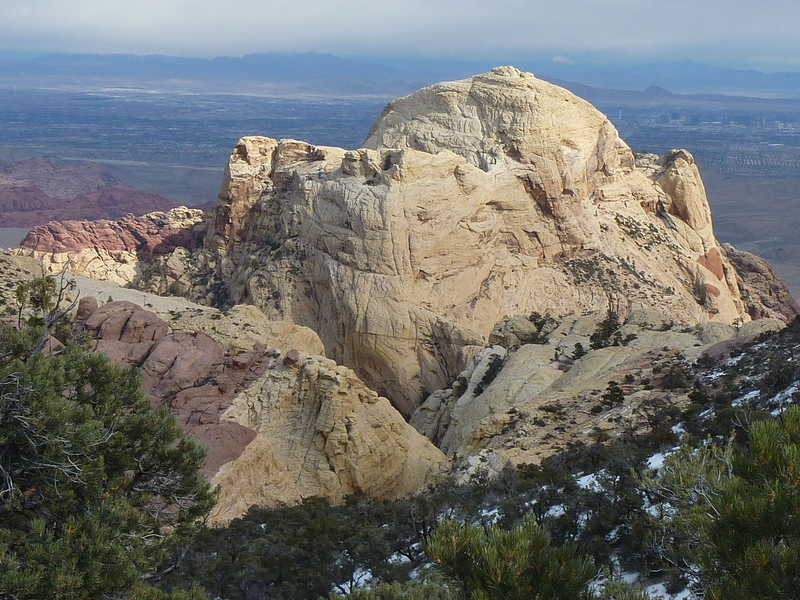 The hike from Red Rock Summit is a little more than 3mi one-way with about 2,600ft of gain on the roundtrip effort. The first two miles are on a good trail that travels through juniper forests along the limestone crest west of Red Rocks' more impressive sandstone features. It was quite cold going over the 7,200-foot crest as we spent about an hour getting to the end of the trail where the limestone meets sandstone. Here the route becomes class 2-3 with some sections proving a good challenge for Leroy. He has quite a good sense on difficult terrain, hesitating where his footing is weak, often looking around for (and finding) easier bypasses. I was hoping we'd be able to get him down to the saddle just before the crux, but a last difficulty proved too much and Eric and Leroy called a halt short of this, hunkering down out of the wind to wait for our return. Three of us continued down to the saddle and then to the start of the crux where Karl announced he'd made up his mind already to turn around. The force of the wind and the sharp sting of blowing hail and snow were key factors in his decision. With better weather he could have been persuaded to continue, I think, but today was not the day to test his limits. Steve was game to continue, and knowing he had the skills and composure for the route, I had little concern for his sake. I knew the route quite well from this point and was confident we could safely negotiate it. With strong winds sweeping across the landscape and blowing bits of snowdrift beginning to collect, we went up the steep crack/ramp crux above the saddle, across the top of the arch by the frozen tenaja, across the second saddle by the hidden ponderosa forest, and then up the steep slabs around the north side of massive sandstone dome to reach the top about 45min after we'd started on the crux. The winds only seemed to increase the higher we got and it was difficult to keep my eyes open without getting pelted by the blowing bits of snow. We were surprised to find a somewhat sunny, relatively calm spot on the leeward side of the summit. I ran up to grab the register box and returned to the small alcove where we spent about 15min eating a few snacks, signing the register and mostly just catching our breath. We returned via essentially the same route, the only real difference that we used the dead tree descent to the frozen tenaja and went through the arch rather than going over it. The weather started to improve as we descended the crux to return to the main saddle, the snow stopping and the clouds making room for some sunshine. We scrambled back up to where Steve had left his poles earlier, then continued up to the trail. When Karl had turned back, he'd joined Eric and Leroy for a nice conversation while watching Steve and I ascend and descend through the difficulties of the route. Once we were down safely, they packed up and started up to the trail, leaving us to catch up with them. We did so just before the trail junction with Crest Peak (signed for "North Peak") and collectively decided to pay a visit to the easy bonus peak only a quarter mile off the return. It was still cold at the easy class 3 summit, but the views had opened up as the low clouds retreated back towards Mt. Charleston. It was 2p by the time we had returned to the lonely jeep waiting for us at Red Rock Summit.